Children and parents playing in living room. 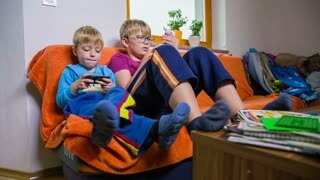 Kids in living room playing on smartphones. Wide jib shot of living room with two brothers on sofa while beautiful day outside, playing with technology toys. Two kids on smartphones. 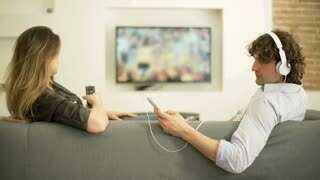 Brothers in living room on sofa playing games on smartphones. Jib shot of kids using technology toys.